This is one of my favorites. 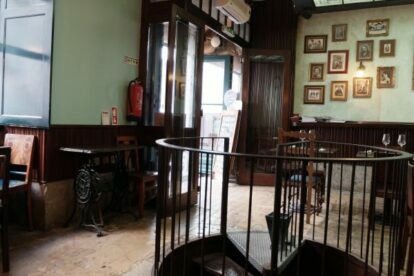 It’s a friendly and quiet cafe with an unique vintage personality, that you simply wouldn’t expect to find where it is – in one of the most touristic and busy areas of the city center. Nothing tastes better than going into Vertigo after having been walking up and down the streets of Chiado among tourists, cars, tuktuks, and your everyday crowd (if you’ve been to Lisbon you know what I mean). For me it’s like going into my grandma’s house, not only for the decor including old sewing machine tables and vintage photos on the walls, but also for the warm, open and welcoming reception you get inside. You can’t go unnoticed and you are sure to be well taken care of. It’s a perfect spot to relax, have a chat with a friend or even work on your laptop. You can have a meal or just a snack and coffee. The food is organic, healthy and delicious, and it is known for their good tea selection. Literally my cup of tea.